Developing a relationship around common interests is a great way to build trust and break the ice with sponsorship decision makers. Thanks to a new field on SponsorPitch's contact profiles we're making it much easier and faster than ever before. With our new field appropriately called Interests it's now easier than ever to get to know and understand a contact's affinity interests before reaching out. Interests are automatically generated by SponsorPitch by scanning publicly available social media for the topics that each marketer most often tends to share updates about on social media sites such as Twitter and Instagram. 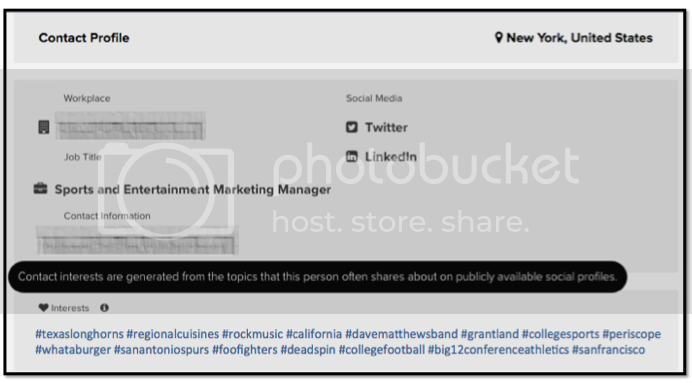 Interests reside on the bottom of SponsorPitch contact profiles just below contact info. Check out this new exclusive SponsorPitch feature below! So imagine being in sponsorship sales for the New York Knicks and knowing in advance that the marketer you're getting ready to call is a big Knicks fan? Or maybe you're selling a food and wine festival sponsorship... would it be helpful to know that the person on the other end of your pitch often posts about cooking shows? Of course, it would. Ok, stop imagining and upgrade your SponsorPitch account to get instant access!